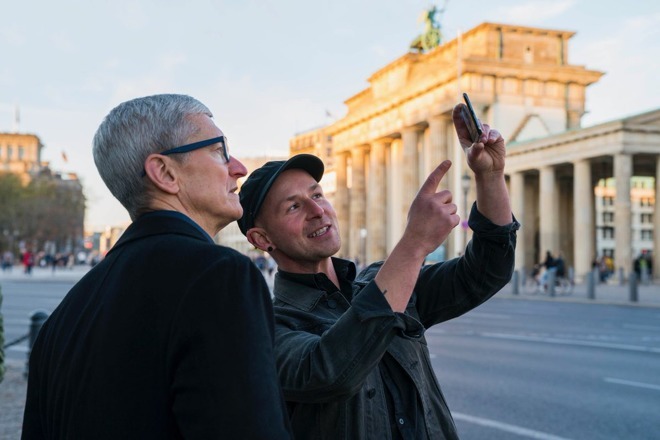 Apple CEO Tim Cook is making a variety of pitstops in Europe ahead of speaking at Wednesday's European Data Protection Conference, and on Monday visited developers in Berlin and Paris. The executive's first destination this week — at least the first shared on Twitter — was Berlin, where he met with one of the developers of mauAR, an augmented reality app that lets iPhone owners recreate the Berlin Wall while walking through the city. The app's name is a play on "Mauer," the German word for wall. It isn't yet on the iOS App Store. Cook later met with the German creators of Asana Rebel, a yoga instruction app. Earlier on Monday, Cook arrived in Paris, where he met with director Claude Lelouch, known for movies like « C'était un rendez-vous » and « Les Uns et les Autres. » The director's next film will be shot on an iPhone, Cook said. Two other Parisian destinations included the offices of Foodvisor and L'atelier des artistes en exil — the latter, as its name implies, is an association for artists in exile. On Wednesday Cook will deliver a keynote speech during an EDPC session called "Debating Ethics: Dignity and Respect in Data Driven Life." The CEO has adopted a vocal pro-privacy stance, attacking companies like Google and Facebook, but not without controversy. Critics have complained that he has been too willing to bend to Chinese government demands that make it easier to control the flow of information.